The Gyrocopter Experience is a flying lesson in a Gyrocopter. Before the flight there will be a short introduction to Gyrocopters and a safety briefing. The introduction may be done as part of a group of like-minded people, whilst lessons are always flown one-to-one with a Flying Instructor. During their flight, our trainee pilots will have the opportunity to take the controls and learn the basics of flying this exciting aircraft. The Gyrocopter is dual controlled and the Instructor will be able to take control at any time. Some people prefer to concentrate on learning to fly the Gyrocopter whilst others prefer to use their first flight to enjoy the scenery and experience the sheer exhilaration of Gyrocopter flying. 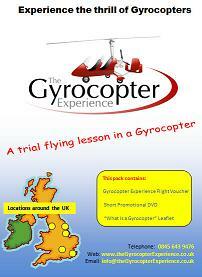 The gift pack includes a voucher for a 30 minute flight in a Gyrocopter. Also in the pack is a short promotional DVD which illustrates the excitement of flying in a Gyrocopter, together with a leaflet answering most of the basic questions people ask and details of the various locations where the vouchers can be redeemed. Purchasing a gift pack gives you something to wrap up and give to the lucky recipient on their special day allowing them to see for themselves what they will experience. You can select your location and book a date & time at a later date at your convenience. Please note the person taking the flight must be over 16 years in age, under 16 stone in weight and in reasonable general health.